We offer the best in video wall technology. Our range of NEC video walls provide superior screen definition and contrast, with a broad range of settings and a high degree of functionality. To give you an idea of the quality of our video wall rentals we’ll now outline some of the key specs that help differentiate them from other models and makes them excellent for a wide range of uses. Our 92” diagonal 2 x 2 wall is one of the most popular of our rented LCD modules. Suitable for computer and video display, the 2 x 2 delivers high resolution imagery. Our 3 x 3 HD wall has a 138” diagonal display with ultra-thin bezels for high resolution. The 3 x 3 is perfect for a large display of high definition graphics. Our biggest wall is the 4 x 3 HD wall which boasts a 184” diagonal display and ultra-thin bezels for increased viewing pleasure. They say fortune rewards the bold. Try this one and you will be rewarded by the positive reaction you’ll get. This wall is guaranteed to impress. Both our 138” and 184” displays have high definition which means improved resolution and picture quality. All our video walls have a high contrast which means a sharper image that improves viewing pleasure. What exactly is contrast? Contrast is the difference between luminance and colour which makes an object discernible. Without contrast, there is no image. All our video walls have a high degree of functionality and a comprehensive range of settings so you can make the wall work for you. There are so many different possible applications of the video wall that the sky is the limit. Concerts, weddings, conferences and conventions are just a few. Our range of sizes caters to all these and more, and our high definition and contrast models will deliver perfect picture quality. 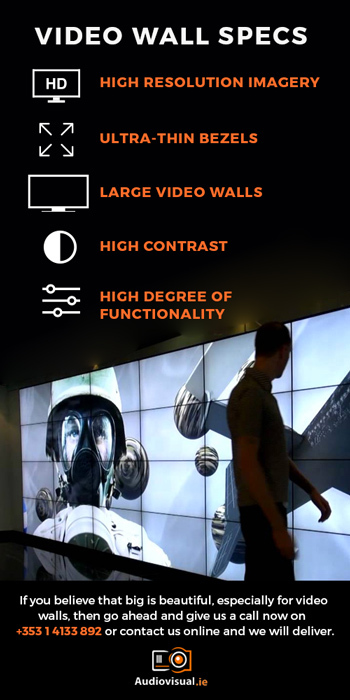 Why Choose A Video Wall? Why choose a video wall over a single large screen? Well, the video wall allows you to customize tile layouts, have greater screen area per unit cost and greater pixel density – all of which contribute to enhanced viewing pleasure. Video walls are now being used in dozens of different ways and the global video wall market is set to double by 2020 as the technology advances rapidly. Choose to hire from us and we will provide the best video wall solution for your occasion. We offer swift and easy installation as well as removal and in the unlikely event of something going wrong, we have a technician on call, ready to fix the problem in no time. So, if you believe that big is beautiful, go ahead and give us a call now on +353 1 4133 892 or contact us online and we will deliver.